Sydney mayor Pat Hills had a trying day on Nov. 18, 1956. 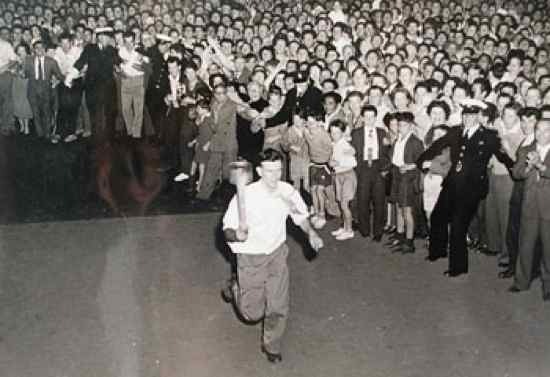 That year’s Olympic torch had been wending its way across Australia and was scheduled to arrive in town that evening, carried by former marathon champion Harry Dillon. Huge crowds lined the streets, perching on fences and climbing poles for a better view. Presently a runner appeared, holding a torch aloft. He bounded up the steps and handed it to Hills, who started his welcome address and then stopped, realizing that the handle he was holding bore wet paint. It turned out to be a chair leg surmounted by a plum pudding can. Students at the University of Sydney had organized the hoax to protest thoughtless reverence for the Olympic torch. “It was being treated as a god, whereas in fact it was originally invented by the Nazis for the Berlin Games in 1936,” said veterinary student Barry Larkin, who had melted into the crowd after handing the fake torch to Hills. “Our friends from the university think things like that are funny,” Hill told the crowd. “I hope you are enjoying the joke.” He was lucky it hadn’t gone off as planned — the torch had originally contained a pair of burning underwear.